SkyDancers.com brand inflatable Sky Dancer attachments are covered by our 3 month limited warranty (from the date of purchase). Sky Dancer inflatable advertising products dance about in the wind, sun, and elements all day long. By nature these products have a finite life-span and depending on the number of hours used, conditions & climate of use, and the surrounding area, the life-span will vary widely. We do know we have formulated our Sky Dancer materails with over 7 years of experience and materials testing. all Warranty only covers SkyDancers.com considered product defect. SkyDancers.com. reserves the final right to grant warranty approval. User is responsible for all warranty return shipping. Cases will not be approved for misuse, neglect, or any form of user error. Approved warranty cases will be issued a replacement unit. For any additional warranty questions please contact us directly. SkyDancer.com brand inflatable Sky Dancer blowers are covered by our 1 year, limited warranty (from the date of purchase). Warranty only covers SkyDancers.com considered product defect. 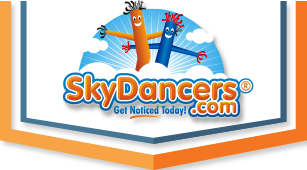 SkyDancers.com reserves the final right to grant any and all warranty approvals. The user/customer is responsible for all warranty return shipping. Cases will not be approved for misuse, neglect, water damage or user error. Approved warranty cases will be issued a replacement unit at the sole discretion of SkyDancers.com. For any additional warranty questions please contact us directly. SkyDancers.com brand inflatable Sky Dancer attachments are covered by our 3 month limited warranty (from the date of purchase). Warranty only covers SkyDancers.com considered product defect. Damage caused by extreme weather is not covered under warranty. SkyDancers.com reserves the final right to grant warranty approval. User is responsible for all warranty return shipping. Cases will not be approved for misuse, neglect, or any form of user error. Approved warranty cases will be issued a replacement unit. For any additional warranty questions please contact us directly. The LED Pillar Attachments are covered, SkyDancers.com brand inflatable Sky Dancer attachments are covered by our 3 month limited warranty (from the date of purchase). Warranty only covers SkyDancers.com considered product defect. SkyDancers.com. reserves the final right to grant warranty approval. User is responsible for all warranty return shipping. Cases will not be approved for misuse, neglect, or any form of user error. Approved warranty cases will be issued a replacement unit. For any additional warranty questions please contact us directly. The LED Pillar Blowers are covered by our 1 year limited warranty (from the date of purchase). Warranty only covers SkyDancers.com considered product defect. SkyDancers.com. reserves the final right to grant warranty approval. User is responsible for all warranty return shipping. Cases will not be approved for misuse, neglect, or any form of user error. Water damage is NOT covered under warranty. Approved warranty cases will be issued a replacement unit. For any additional warranty questions please contact us directly. SkyDancers.com brand Giant Inflatable Promo character attachments are covered by our 3 month limited warranty (from the date of purchase). Warranty only covers SkyDancers.com considered product defect. SkyDancers.com. reserves the final right to grant warranty approval. User is responsible for all warranty return shipping. Cases will not be approved for misuse, neglect, or any form of user error. Water damage is NOT covered under warranty. Approved warranty cases will be issued a replacement unit. For any additional warranty questions please contact us directly. Custom or made-to-order SkyDancers.com products are covered under the appropriate above listed warranty policies. See the links below to see warranty details for each type of custom product.